After completing my research into Ella Harper I stumbled upon Martin Emmerling’s story. Here was another performer that precious little was known about, and like Ella, he had many question marks in his life story. I had already started working on Ruth Mignon not too long after I started Ella’s research. Ruth was for when I needed to take a break from Ella. I had recently reached an impasse with Ruth so Martin seemed made to order for me. The info available online about him included the facts that he was born in Bavaria, Germany and had trained himself day-by-day over a three year period to turn his head around 180 degrees. After doing this he performed in Europe for a while before coming to the U.S. around 1921 and performing here until not long before his death about 1955. There were stories about his being a Nazi sympathizer and of his wife having him arrested in 1931 for desertion. He had performed with many shows, most notably Dreamland Circus at Coney Island, Ringling Brothers and Ripley’s Odditorium. I knew from the start that this guy was going to be tougher researching than Ella was because he was not local to me like she was. He would probably be more difficult like Ruth was. So for what it’s worth I will give you what I found out and hopefully someone else that has local ties can carry on the search. 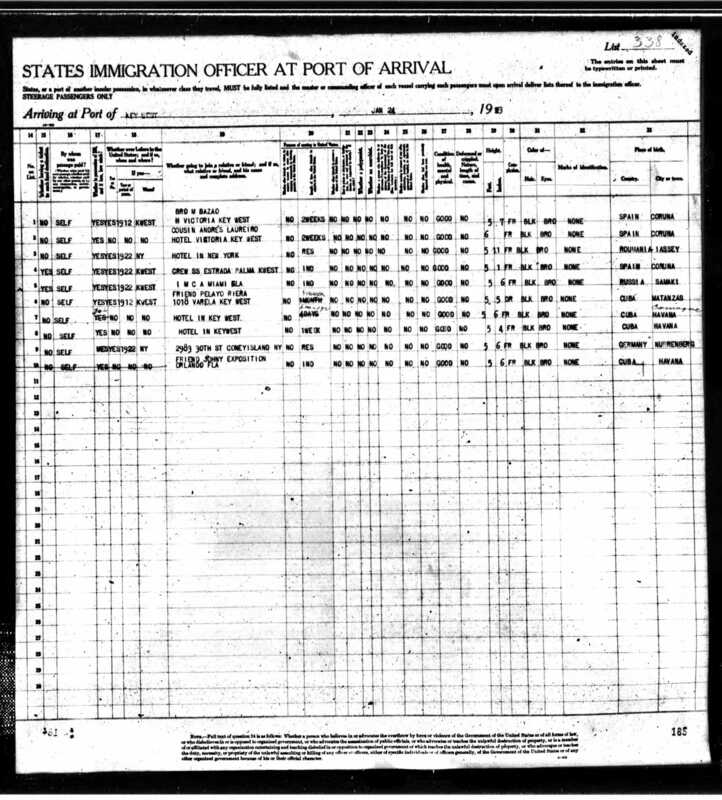 After creating his tree on Ancestry my search brought up his arrival record from 1921. 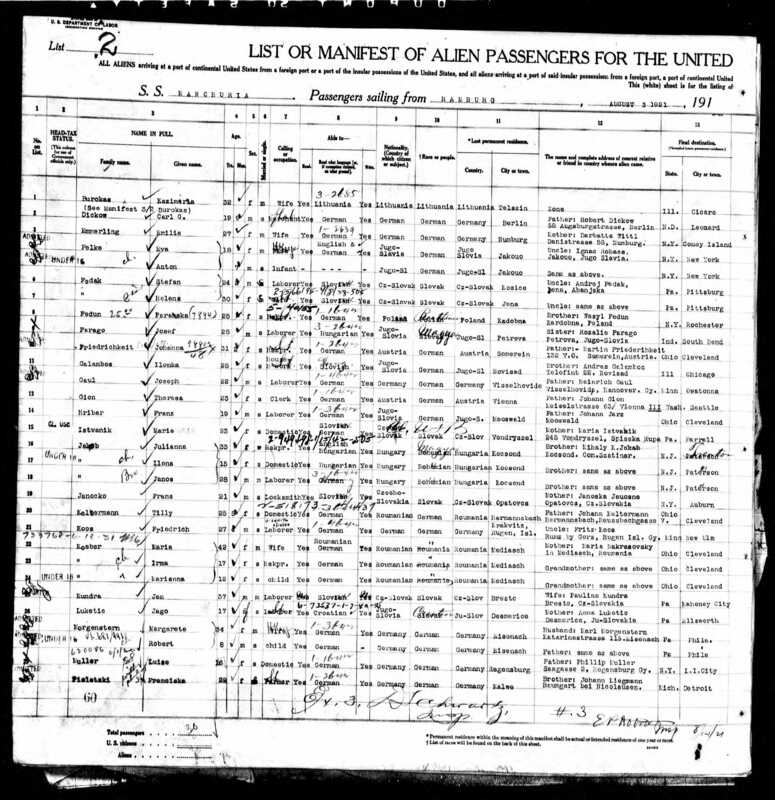 I love the passenger lists from the early 1900s because there are two pages of info, not just the normal one. Note the name of the ship at the top. It was the Olympic, sister ship to the Titanic. 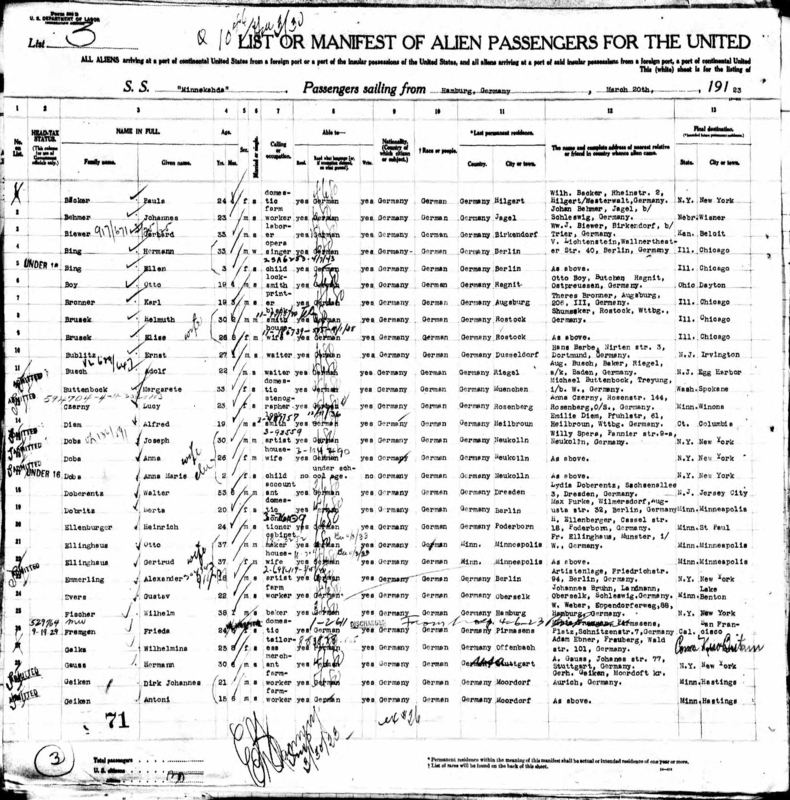 Before you read the 2nd page of these passenger lists you need to get the passenger number from the first page that is assigned to the person you’re researching because the 2nd page lists them by their number only. Martin’s number is 16. Looking at this page shows that his employer paid his fare. 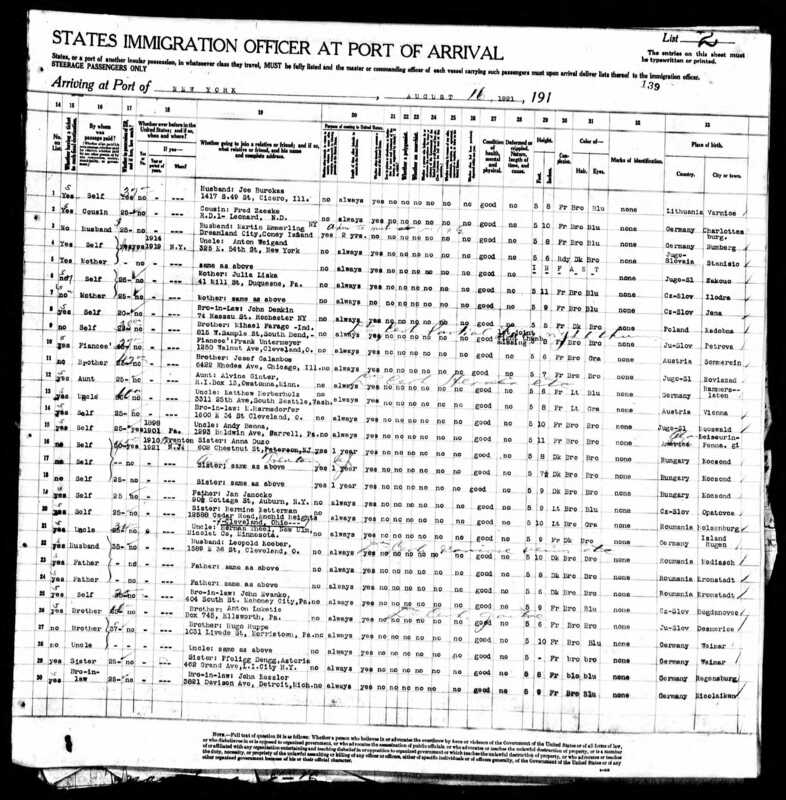 Column 19 shows that he and several others were going to Dreamland at Coney Island. This would be the employer that paid their way. Speaking of WWII, it was at this point that I came across the 21 October 1942 enlistment into the U.S. Army of Martin’s son, Albert. It was almost immediately afterwards that I found out that he had died in Europe on 14 April 1945, just three weeks before the end of the war. 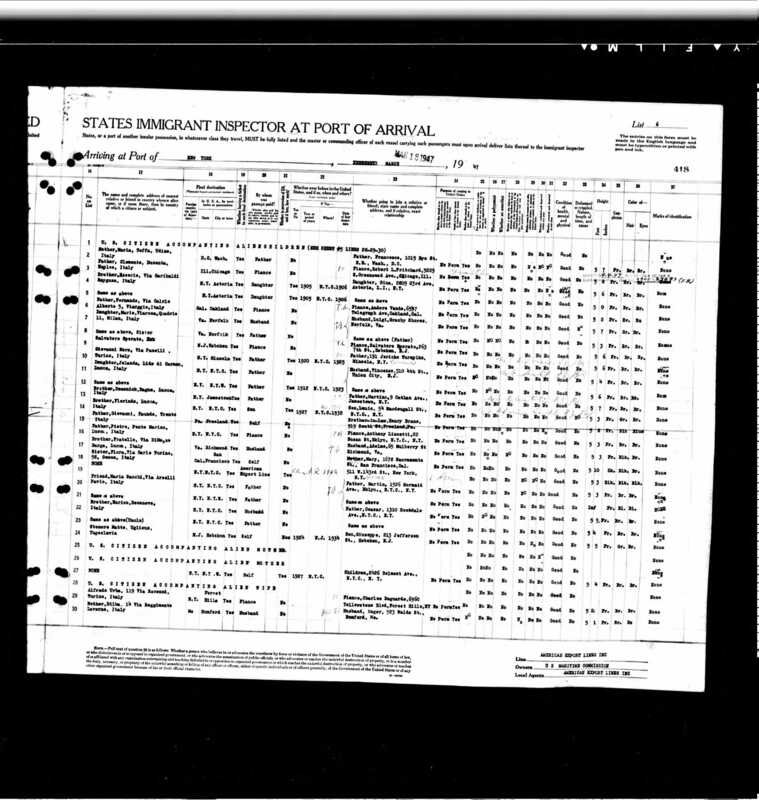 When I found his U.S. National Cemetery Interment Form, it gave his birthday as 4 May 1922. He had apparently been buried in a cemetery in Luynes-Aix-En-Provence in France and his body had been brought back home three years later and re-interred in the Long Island National Cemetery, which is in East Farmingdale, New York. 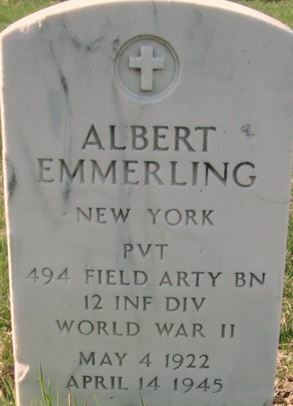 Albert’s tombstone at the Long Island National Cemetery. One of the things you almost always run across doing genealogy are sad stories. This is one of those. Martin is often slammed for being a Nazi sympathizer. Personally, I’ll give him a pass. He came from Germany in the 1920s when Germany was in the utter chaos that resulted from WW1 and poverty and unemployment were extreme. I am sure he loved his country and probably saw the positive changes that appeared to be taking place during the early part of Hitler’s rise and Martin probably fell under the spell, as many Germans did. Yet his own son gave his life for Martin’s adopted country. This all made me curious as to how Albert died. I was finally able to locate the casualty lists from every unit in the 12th Armored Division and the timeline and after-action reports. Not a single unit showed Albert as dying in action or from wounds. So did he die from non-battle reasons? And in a sick, ironic twist (assuming I read the reports correctly) it would appear that if he was with his unit about the time he died (and not back in France in a hospital or something) he would have died in or around Nuremberg, hometown of his parents. 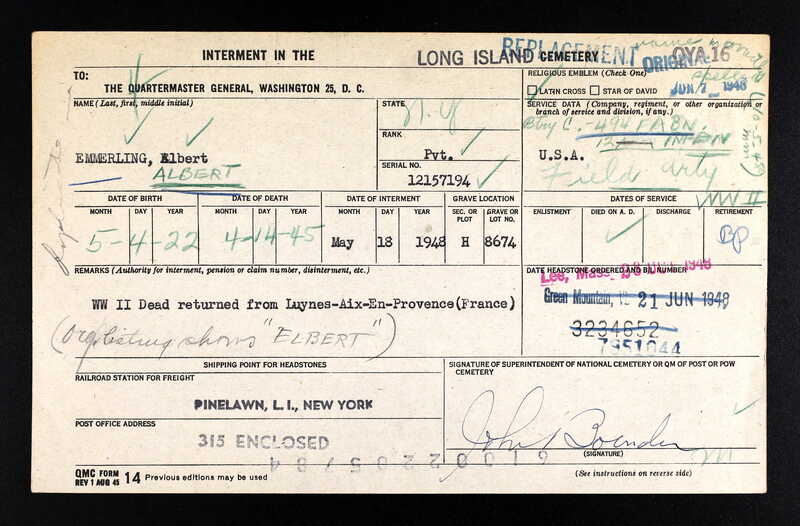 Eventually I came across the website for the New York Military Museum and their information confirmed that Albert died from non-battle reasons, although it does not say from what or where. Maybe if one of our readers is in the Saratoga Springs, New York area they could dig deeper at the museum. If so, Albert’s serial number is 12157194. The next thing I did was to concentrate on Albert’s brother, Walter. Very little was out there but I did find where he passed away in Queens, New York on 1 September 1983 and is buried in the Rosedale and Rosehill Cemetery in Linden, New Jersey. Also buried in the same cemetery is his mother, Emilie. She had died in Brooklyn in May 1977 and was born 17 February 1895. There is also a Jean Emmerling buried there. Given that her birth date is 24 November 1928 I would assume she was Walter’s wife, although I could never find any marriage records for either son. She passed away 11 February 1990. It was at this point that I found a newspaper story confirming Martin’s desertion of his wife in 1931. Essentially, Emilie sent a telegram to the Baltimore police to have him arrested as she knew he was down there doing some shows. They found him during a performance and did just that. Since they were still together in the 1940 Census the desertion apparently didn’t last too long. I’ve never been able to find where he got the stage name Laurello from. Any ideas anybody? (More on this in updates below) In any case, I got excited for a different reason when I saw this story. I had been unable to find them in the 1930 Census. This story took place in May of 1931. Notice at the bottom that it gives their address in Brooklyn, 1627 Mermaid Avenue. It was entirely possible that I could use this address to find them in the census now. Many times in a census, especially if it’s a foreign surname, the enumerator taking the census can really butcher the spelling, which makes finding the person very difficult. It’s the same problem if the person who transcribed the census for being placed online ends up butchering it. So off I went searching. When I found the address it turned out to be some entirely different family, so sometime between the census in 1930 and May 1931 the Emmerlings moved to that address. It was another dead end. This is when I remembered that New York State did a census in 1925. Maybe I could find them there. It took some very creative searching, but find them I did. The problem was exactly as I mentioned earlier. The enumerator screwed it up very badly. 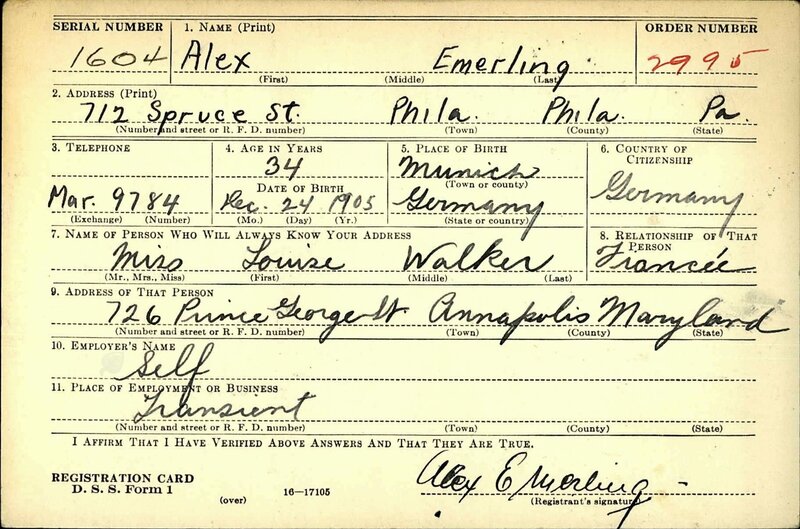 He had listed their last name as Emily, not Emmerling. I must admit, however, that you can hear how the two names do sound very similar. What I saw though on this census really took me by surprise. They were living at 3036 W 2nd Street in Brooklyn and it turned out that Martin and Emilie had four more children, all born in Germany and all of whom apparently came over near the time their mother did. There was Robert, aged 11; Johanna, aged 9; Emilia, aged 8; and Annie, aged 5. 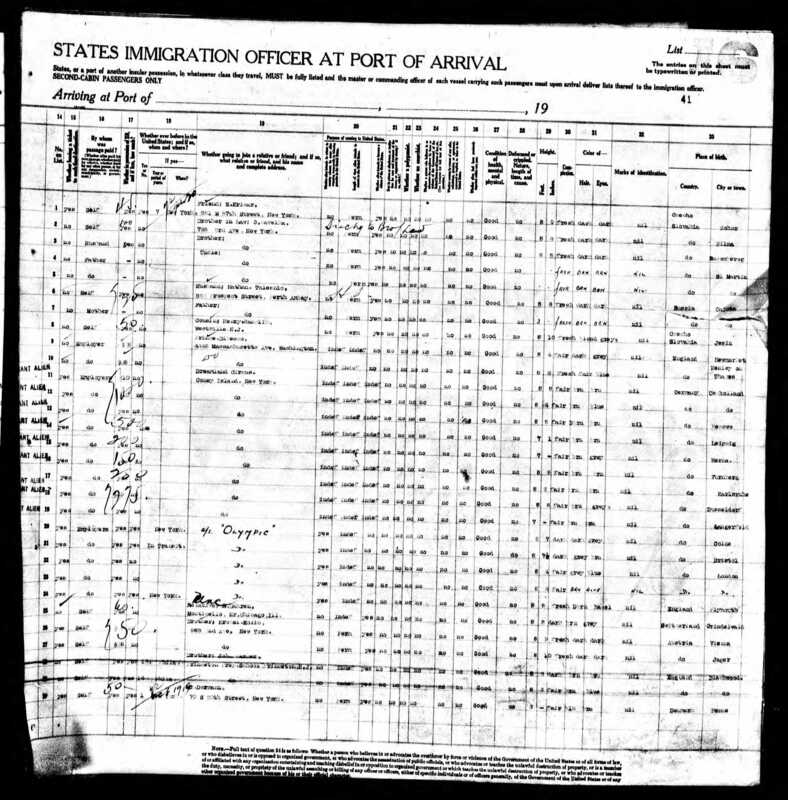 The census shows that the children all arrived in the U.S. in about 1922, although I have yet to find them on any passenger lists. Further research into these additional children has been a dead end, with the exception of young Emilia. 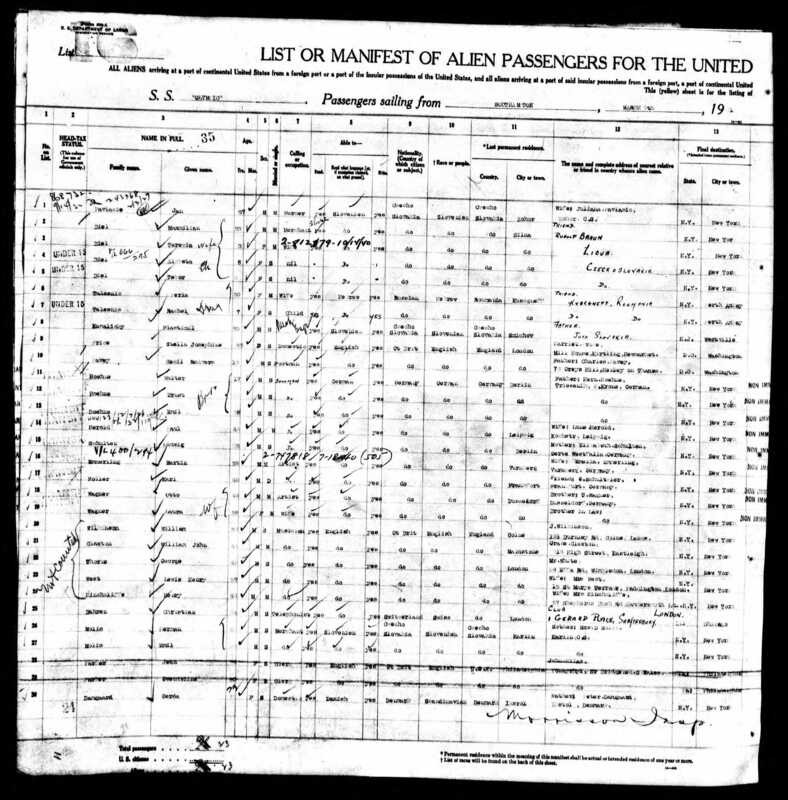 1925 Census You’ll find them on the right page. As far as Martin is concerned, I found numerous articles about performances all across the country. The last one I could find was from 3 May 1952 in North Hollywood, California. The trail on him dies after this (More on this in updates below). Although most sites list his death as 1955 I never found any paper trail to prove it. In the process of this research I came to find Martin a very interesting fellow and I would love to find out whatever happened to him and the rest of his children. Any reader’s in the Brooklyn area or even living family members please feel free to contact me with any further revelations. Update 19 Aug 2015: I had noticed while researching for another blog that Ancestry.Com had been putting something new online, the Social Security Applications and Claims Index. If you find someone on this list it may provide more information than just the normal Social Security Death Index. Fortunately, Martin was in it. He died 7 November 1953. It does not say where, however. His Social Security number was 528-10-3596. The odd thing about this is that it means he got this number issued by the state of Utah. I’ve never seen anything tying him to Utah. Sadly, further searches using this information didn’t reveal anything. Update 27 Aug 2015: Today I discovered that Walter Emmerling’s wife’s name was Jean Elizabeth Schalling, daughter of Frederick Schalling and Jean Prime. She was born in Brooklyn and died in Queens, New York. 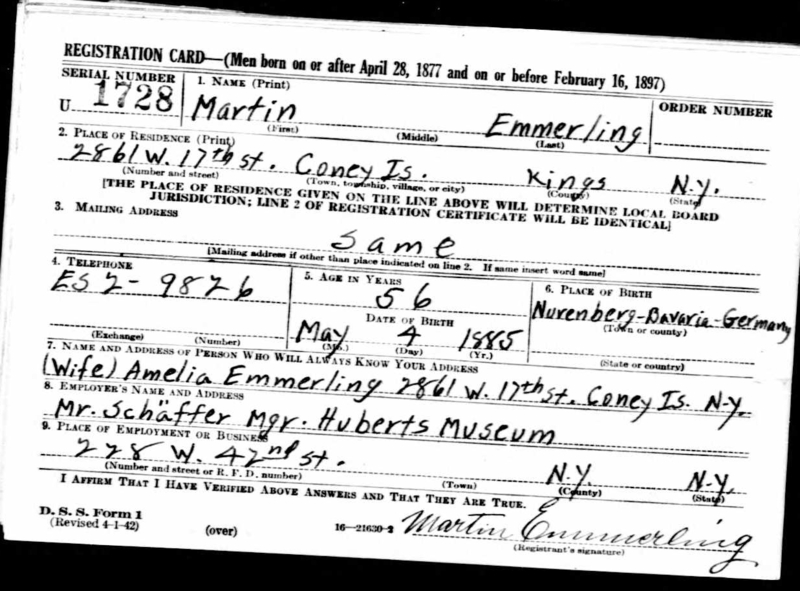 Update 28 Aug 2015: With the ongoing addition of the Social Security Application Index up on Ancestry I came across the one for Martin’s daughter, Emilia. She was born 3 February 1917 and sometime before December of 1947 she had married someone named Scovanni. Next, sometime before September of 1962 she had married a Cahill. She passed away as a Cahill 5 February 2006 and her residence at the time was listed as Smithtown, New York. 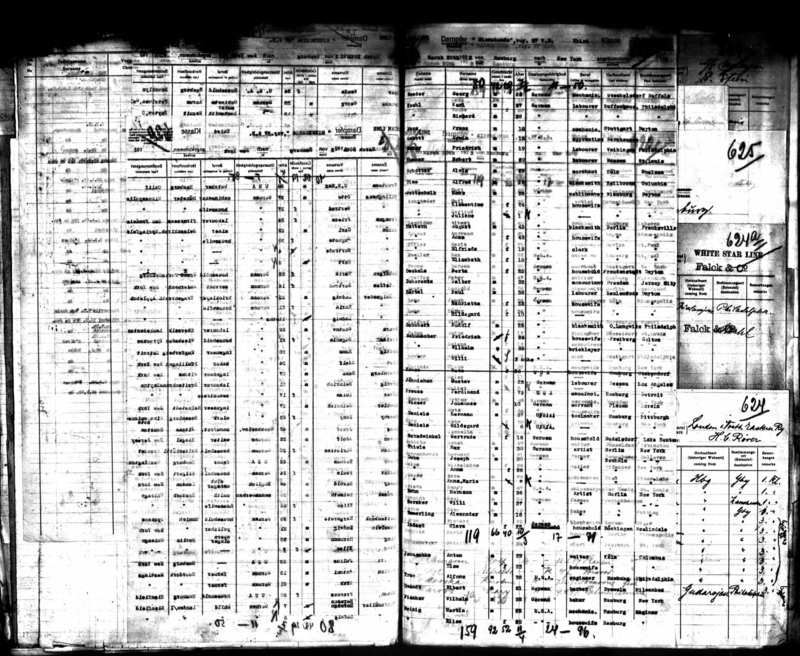 Update 27 Sep 2015: Getting flustered by not finding the family in the 1930 Census or his German children anywhere online, I started going over some of the things I did already have. The newspaper clipping from his desertion arrest mentions that he abandoned his wife and TWO children at home. So where are the others, most who would still be young enough to be living at home? 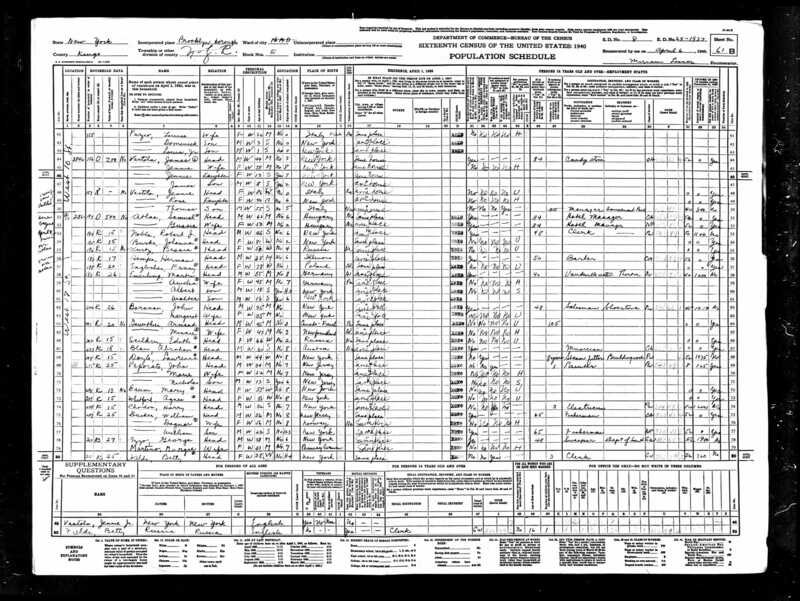 My theory is that the entire family went back to Germany and were there during the 1930 Census. 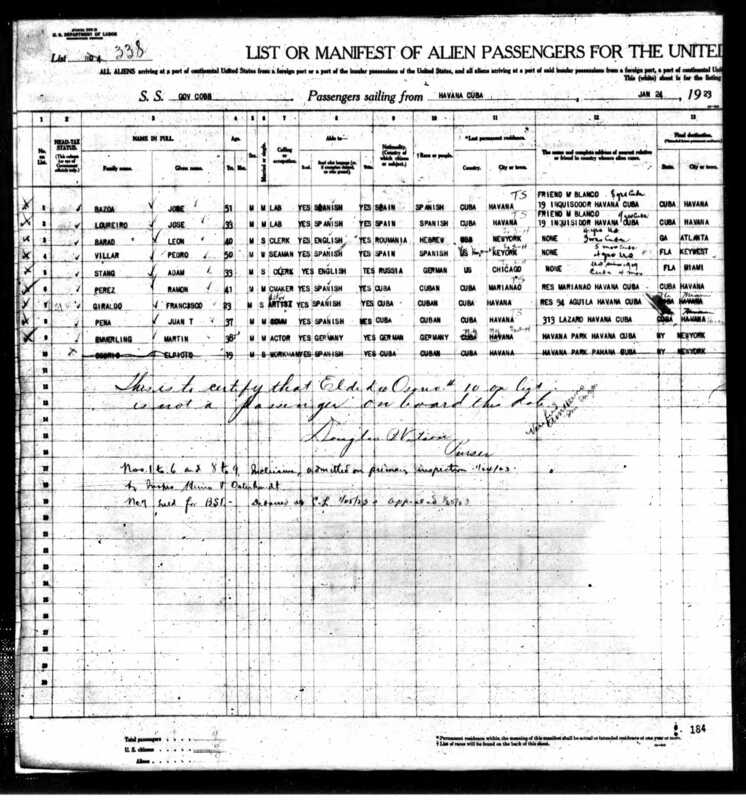 Then Martin, Amelia, Albert and Walter came back to the U.S. before his 1931 arrest. The German children probably were more comfortable back in Germany. Update 27 Oct 2016: It’s been a long time since I was able to find anything. Today I discovered three things up on FamilySearch. These were Martin’s and his wife’s birth info from Germany and also their marriage. Martin was definitely born on 4 May 1885 in Nuremberg, Bavaria, Germany. His wife was born there also on 17 February 1895. Her full name turned out to be Anna Margarete Emilie Wittl. Their marriage was in Nuremberg, Germany on 12 February 1916. Unfortunately, none of these three items gave their parents’ names. Update 18 Jan 2018: I don’t have the time to do this update in its entirety so it will be broken into multiple ones. First off, I had recently discovered that Martin had a prior marriage. In Nuremberg, on 6 September 1906 Martin married an accountant named Laura Prechtl. Their first son, Alexander, was born the year before in Munich, on 24 December 1905. 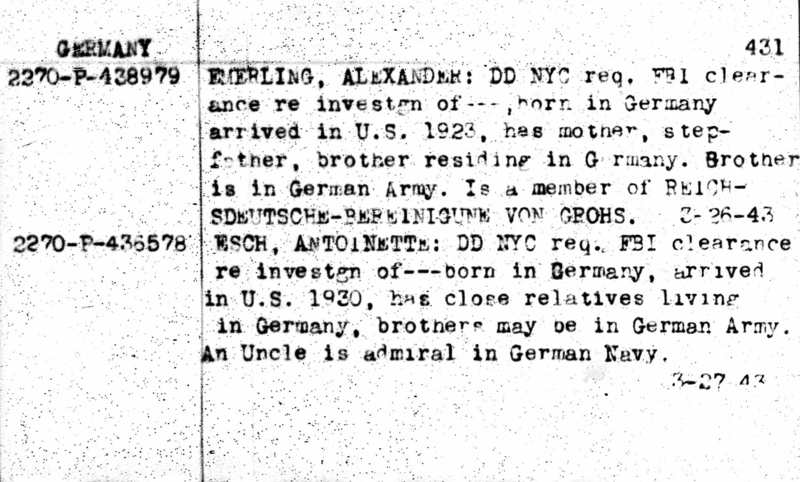 They then had a son named Georg on 9 May 1907 in Nuremberg. Martin’s oldest son with Emilie, Robert, was born 24 September 1914 in Nuremberg. This is several months before Martin and Laura divorced on 24 December 1905. My later research into Laura was very limited. All I could find out was that she later married a man with the surname of Ploesch. There is also a theory that Laura’s name is where Laurello comes from, and I tend to agree. To me this means that he probably started performing shortly before or during his marriage to Laura. Update 20 Jan 2018: Between the new information continuing to arrive from family and my further digging with that information, I’m able to add more to Martin’s story. It turns out that Martin’s oldest son with Laura, Alexander, came to the United States around the same time that Martin’s children with Emilie came over. 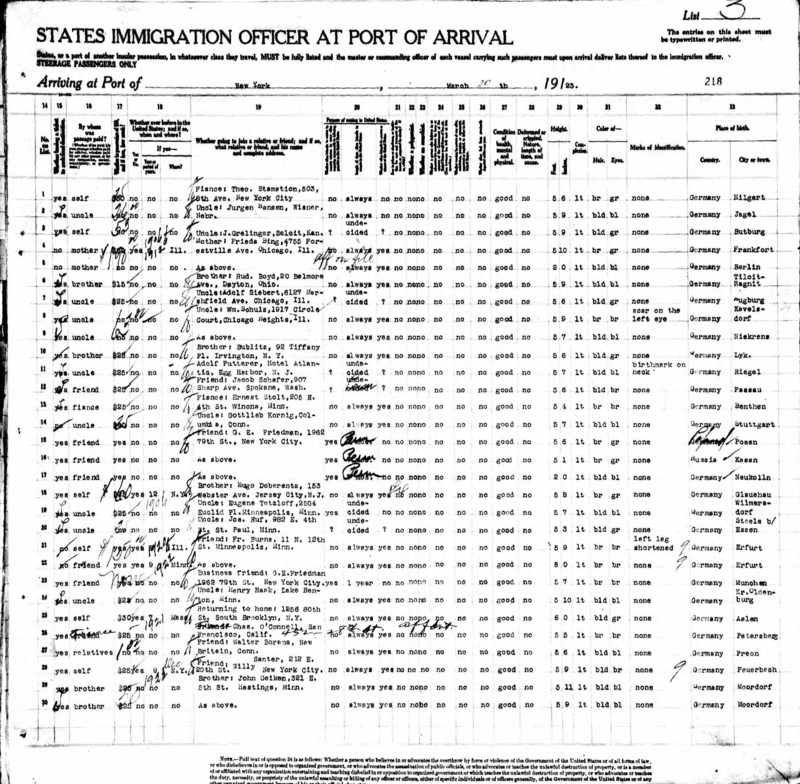 He departed Hamburg on 20 March 1923 and arrived in New York City on 30 March. On page two (he’s number 23) he makes mention that he’s only staying for one year. Whether that was his true intention or not, he ended up staying for the rest of his life. By 1940 he was living in Philadelphia and was engaged to a young lady from Annapolis, Maryland but I don’t believe they ever married because she married someone else within two years. He joined the U.S. Navy in 1943 and, because of his heritage, was investigated by the FBI. After the war, in 1949, he married a young German lady named Erika Anneliese Koelbl. She had come to the U.S. in 1937. They lived out their lives together in New York City. Alexander passed away in 1960 in Manhattan and Erika passed in 1986. One final note about Alexander, he was buried in the same national cemetery that his half-brother Albert was buried. Update 21 Jan 2018-A: The family provided me with more information on Martin and Emilie. They also stressed that this information is in no way 100% guaranteed. Martin’s father was Immanuel Georg Emmerling and his mother’s surname was Steinlein. Martin had three brothers. These were Schorsch, Franz and Ernst. He also had two sisters but for now their names are lost. For Emilie, her father was possibly Georg Wolfgang Wittl and mother was Babette Kraus. Babette’s brother, Phillip, was a classical philology professor. Emilie had two brothers, Thomas and Hans. Thomas was a banker and Hans died in France just one month into WW1. She also had a sister named Emmi. Update 21 Jan 2018-B: Decided to do another update today, hence the -A and -B in the date. 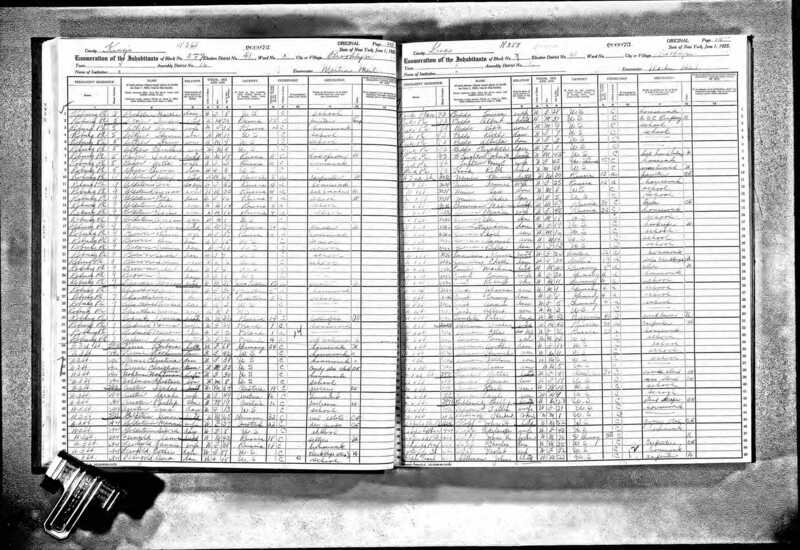 With more information provided to me I learned that when I found Martin’s German children in that census, the enumerator had made an error and I had missed that when first doing the blog. Martin’s son, Johann, was actually his daughter, Johanna (this happens a lot more than you think). I’ve gone ahead and corrected that error in the blog. It turned out that Martin and Emilie toured together in Europe with his act, with Emilie as his assistant. This is a picture of him and Emilie in a typical performance. Martin and Emilie gave the two oldest children, Robert and Johanna, to foster parents to raise while they toured around Europe. The two children even used their foster parents’ surname while living with them. Emilia and Annie were raised by Emilie’s mother, Babette. Martin and Emilie did visit their children when they could, until their immigration to America. The foster couple both had degrees in child education but had no children of their own. Also, they were staunch social democrats. Why is this important? Well, it’s doubtful that any Nazi sympathizer (as Martin has been portrayed) would leave his children in the care of firm liberal intellectuals. Additionally, though Martin was Protestant and Emilie Catholic, there were Jews on his wife’s father’s side. To finish off this point, I never once found a single item in the records or in the newspapers referring to Martin and Nazis. The only place I found anything about it were websites claiming it. Martin even let two of his own sons fight against Germany. So unless anyone can provide any proof, let’s put that whole Nazi rumor to rest. Update 26 Jan 2018: Much of this update comes from Martin’s son, Robert, and confirmed by researchers in Germany. Martin was a tinsmith but ended up early on working in small circuses as an equilibrist. This is a balance specialist, primarily tightrope walkers. His first wife, Laura, was an accountant but worked with him in these circuses as a trapeze artist. They performed around Europe but, while giving a performance in St Petersburg, he fell off the rope from about 10 meters up. 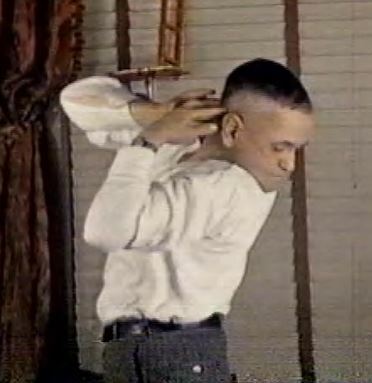 This resulted in some very complex bone fractures and is most likely when he began the training to revolve his head. This would also explain the complete lack of any records for him serving in WW1. Update 25 Jan 2019: Note: All of this information is provided by the reader named Ingo Marx that I mentioned at the beginning of the blog. All credit for this info belongs to Ingo (thank you, Ingo!!). 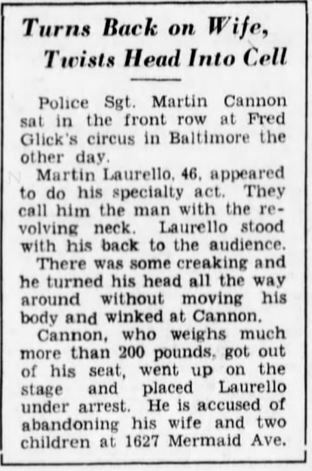 The pdf-file off that German website on Martin Laurello’s page states that, prior to his accident, he was a contortionist, more exactly a snake man, known mononymously as “Laurello”, who wormed his way through a ladder, wearing a (supposedly snakeskin-like) costume. He did that in Schichtls Zaubertheater (Schichtl’s Magic Theater). This show attraction still exists and is famous for “decapitating” people live on stage. I forgot: The aforementioned pdf-file on Martin Laurello also states: In 1938 the magazine “Coral” (orig. “Koralle) revealed his secret with an X-ray (headlined “the man with the turning head”): He had an intervertebral disc between two cervical vertebrae. Unfortunately they didn’t mention where he got that from. My anatomic knowledge is very limited, but as far as I’m aware, you can’t buy them over here. Interesting. You would think that by 1938, they would have forgotten him here in Germany, but obviously this was not the case. 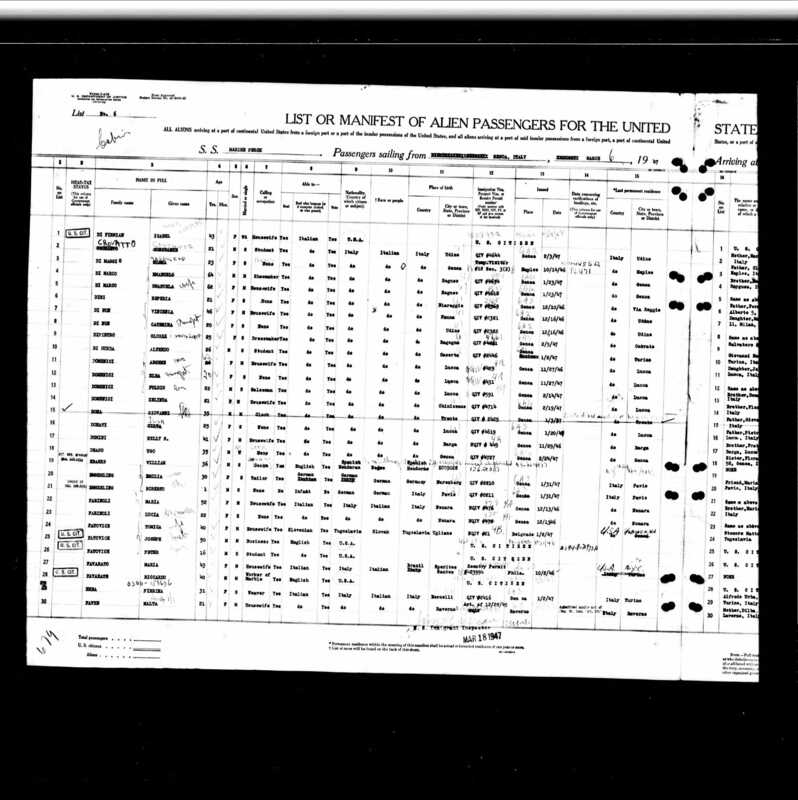 The author of Martin’s PDF info is the grandson of Martin’s mother. I’m not even sure in German, but I think that means he is Martin’s grandnephew and Martin was his great uncle (at least I think these are the correct descriptions here [they are! – Ray]). Martin lived with his mother across the street from the author, so he must have known them pretty well too. He states that Martin, who traveled Western Europe, Russia and America as an artist, frequently asking other artists who were scheduled to perform in the Nürnberg area (= Nuremberg) to visit Martin’s mother and send his compliments and tell her about his adventures. The author would then regularly join his grandma and listen to what all these international artists had to tell them about Martin. But he continues talking about the many conflicts within his family and between them and other people at that time, so I’m not surprised there may be conflicting information around. He then mentions an uncle, a metal worker, who met a contortionist and was eager to marry her. It took this uncle more than a year to get the permission from the contortionist’s father, who was a railroad official. This was even more complicated, because the uncle was an Evangelical and the contortionist a Catholic. It is not clear, if he is talking about Martin here (the contortionist makes me believe so) or if he is referring to another (great-?) uncle, especially as he states having been the postman from time to time in that – what he calls it – a little disaster of a relationship. Update: Yes, Martin did wear a snakeskin-like outfit, like I suspected, We can see this on the promotional postcard attached, dating from around 1915. And surprisingly, he *did* have sort of a surname back then: Elastik. So that’s what he looked like before he started turning people’s heads by turning his own (by the way: That joke doesn’t even work half as smoothly in German). Just when I had forgotten about my back pain, I found this picture – I’m slightly amazed! As I subsequently found out, this could have been a lot easier, as this postcard is currently for sale on ebay. I also started searching for the “Koralle” issue I mentioned before, but this magazine appeared weekly and so far, I don’t know which issue featured the article with his X-ray. Finding pre-war magazines from that era in Germany tends to be some sort of lottery, as the vast majority of them no longer exists and I guess you have an idea why that is the case. I found a couple of issues from 1938, but none of them was the one I was looking for. So if I ever come across the issue in question, I’ll let you know. In his spare time he hit the gym (that’s not what they said back then, is it? Health club sounds more appropriate). This health club was the renowned “Athletenclub Sandow” (Sandow’s athletes club), where he didn’t care about the usual weight lifting, but preferred the artistry instead, as mentioned by the Nürnberger Zeitung, Nuremberg newspaper, in 1955. These efforts lead to him becoming the snake man. A little digression: Eugen Sandow was the inventor of a new sport – modern bodybuilding. His methods of physical training were taught worldwide. Sandow was born Friedrich Wilhelm Müller un April 2 1867 in Königsberg, East Prussia. 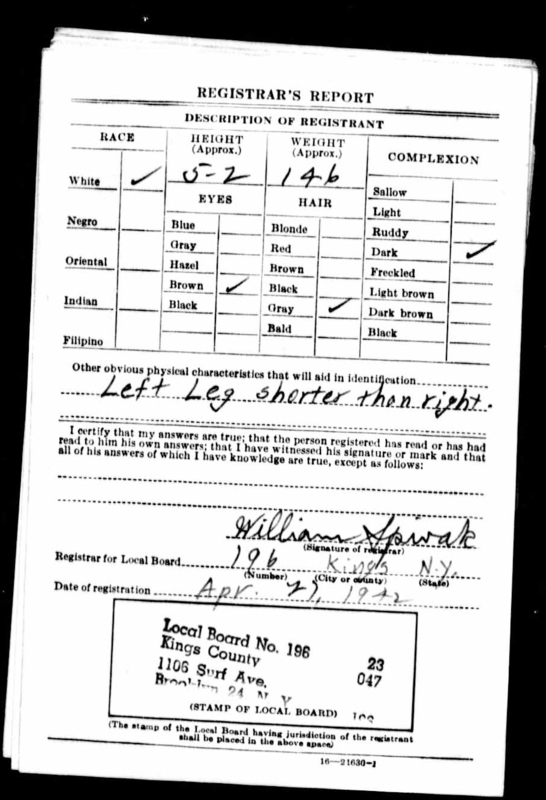 After Martin’s St. Petersburg accident he spent several months in hospital, until he finally left with his left leg being shorter than the right one (as mentioned on the WW II draft card you already put on your blog). And another thing was different after his recovery: He could now turn his head 120 degrees back instead of just 90 degrees to the side. He decided to make use of that new special feature and mounted two “Eisenkrampen” (“cramp iron” might probably do the job) to a wall, upholstered these with leather. He then squeezed his head between these things and started to turn it slowly, bit by bit, until his head sat with his nose over his spine one day. He had been working for four years on this performance – but these four years also include the additional time he spent learning how to juggle (!) with his head turned backwards! A Ringling Bros. and Barnum & Bailey agent spotted Martin during a vaudeville show (we called these “Varieté) in Chemnitz and signed him up shortly after WW I. The allegations of him being a Nazi sympathizer came from fellow side show performer Percilla Bejano, the bearded lady and “Monkey Girl”. She once stated “He was a Nazi and he didn’t like the US flag,” and to me this sounds like she said that after he had passed away. When getting older and less flexible, Martin started training dogs and cats for show purposes. It is obviously based on your blog (uncredited, of course – journos! ), but the writer also gathered more info from the municipal archive of Nuremberg, as well as the Associated Press info and the Nürnberger Zeitung. I had come across Martin many times before on various websites, but this article adds some info I hadn’t seen anywhere else before – so in the English speaking world some of the details are pretty much unknown to date. Comments are welcome and encouraged. You’ll find them here near the bottom or a link to them near the top. Also feel free to share, like or follow this or any of my blogs.